Stephen John Lyons (born June 3, 1960) is a former Major League Baseball player who currently works as a television sportscaster for the New England Sports Network (NESN). He is of French and Irish descent, and currently resides in Hermosa Beach, California. He was initially an outfielder and third baseman, but found a niche as a utility player. He played nine seasons in the majors, from 1985 to 1993, during which he was released a number of times. After his retirement, he became a television baseball commentator. Lyons was born in Tacoma, Washington, and grew up in Eugene and Beaverton, Oregon. His father, Richard Lyons, was a star athlete at Hudson (MA) High School, who encouraged him to play baseball. He attended Marist High School in Eugene, before graduating from Beaverton High School in 1978. He attended Oregon State on a partial baseball scholarship. After his junior year, Lyons was a first round draft pick (19th overall) by the Boston Red Sox in 1981. He left Oregon State without graduating, to begin his baseball career. After playing for 3 and 1/2 years in the minor leagues, Lyons was promoted to the Red Sox due in large part to having an impressive spring training in 1985; in addition to hitting well, his speed on the bases, and his ability to play a number of positions contributed to the decision. Lyons made his major league debut with the Red Sox in April 1985 at age 24. Lyons was traded to the Chicago White Sox for pitcher Tom Seaver in June 1986. After five seasons with the White Sox, he returned to the Red Sox in 1991. In 1992, his playing time diminished as he shuffled from the Atlanta Braves to the Montreal Expos and back to the Red Sox for a third time. In 1993 Lyons was with the Chicago Cubs during spring training, and was picked up once again by the Red Sox in May. This was his final season as a player. Lyons has the rare distinction of having played at all nine positions on the field at the major league level, although in an exhibition game. The game, known as the "Windy City Classic," took place at Wrigley Field on April 23, 1990. He also appeared as a designated hitter and pinch hitter. He appeared twice as a pitcher in relief, giving up 4 hits, 4 walks, and 1 run in 3 innings (for a 3.00 ERA). His career batting totals included a .252 batting average, 19 home runs, and 196 RBIs. Lyons' colorful personality earned him the nickname "Psycho." He was known for such eccentricities as playing tic-tac-toe and hangman with his spikes in the infield dirt during games. His most remembered incident occurred at Tiger Stadium in Detroit on a Monday night in 1990. In a televised game played on July 16, he created a stir that was replayed countless times. After sliding headfirst into first base to beat out a bunt hit, Lyons pulled down his pants to empty the dirt out and brush off his shirttail. After a few seconds (and a reaction from the crowd of over 14,000), he realized what he had just done and quickly pulled them up, humorously embarrassed. Although wearing sliding shorts under his White Sox uniform, this incident earned him another nickname, "Moon Man" Lyons. At the end of the inning, women in the stands waved dollar bills at him as he came to the dugout. After his retirement from the playing field, Lyons became a color analyst for Fox Sports' MLB coverage in 1996, working first in a studio pregame show (with Chip Caray and Keith Olbermann) and later on game coverage (usually with Thom Brennaman). He called several Division Series and League Championship Series telecasts for the network. Lyons was fired by Fox Sports on October 14, 2006 for making ethnically insensitive comments during his broadcast of a 2006 postseason game. He was part of the Arizona Diamondbacks' broadcast crew in 2003-04, and from 2005-2013 served as color analyst for the Los Angeles Dodgers on Prime Ticket and KCAL on television broadcasts originating from outside the NL West, broadcasting first alongside Charley Steiner and then Eric Collins. He also co-hosted the Dodgers pre-game and post-game shows for Prime Ticket. Lyons made his debut video game appearance as a broadcaster in All-Star Baseball 2005 along with Thom Brennaman. He is a broadcaster in the MLB: The Show series. On October 12, 2013, Lyons announced that he would not be returning to the Dodgers the following season. In 2014 Lyons joined the New England Sports Network (NESN) as a studio analyst for NESN's coverage of the Red Sox. He returned to NESN for the 2015 season. Lyons has been known to make ethnically insensitive comments on multiple occasions; for example, implying that it was okay if a Japanese journalist's camera was smashed by Hideki Irabu, because as an Asian journalist must have half a dozen spares. Lyons was suspended briefly without pay after his remarks, and the network apologized for Lyons' comments, though Lyons never made an on-air apology. The man turned out to be nearly blind, except for limited peripheral vision in one eye, and this headgear were special glasses (a "JORDY," a magnifying device) that allowed him limited vision with which to see the game. Brennaman later apologized to the man and his family on-air during Game 3 of the series. During their broadcast of Game 3 of the 2006 American League Championship Series, broadcast colleague Lou Piniella, who is of Spanish descent, used an analogy about finding a wallet, and then spoke briefly in Spanish. Lyons said Piniella was "hablaing Español" – Spanglish for "speaking Spanish" – and added, "I still can't find my wallet. I don't understand him, and I don't want to sit close to him now." On October 13, 2006, Fox fired Lyons for making the remarks. Lyons was replaced for the last game of the series in Detroit by Los Angeles Angels announcer José Mota. Piniella later stated that he thought that Lyons was just "kidding" and that Lyons was, per Piniella's experience, not bigoted. On October 16, 2006, the Dodgers announced that they would keep Lyons as a commentator for their road games. The team said that they gave Lyons probationary guidelines and that he would undergo diversity training. Lyons also continued to host the Dodgers' post-game show Dodgers Live. 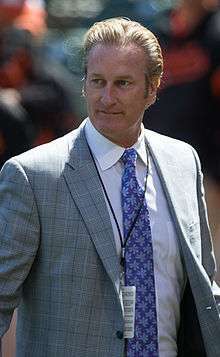 Lyons wrote an autobiography titled Steve Lyons: PSYCHOanalysis that was published in 2001. (ISBN 1-58261-360-5). ↑ Peter Gammons, "Snow Puts Rangers, White Sox in Hole." Boston Globe, April 11, 1982, p.52. ↑ Dwight Jaynes. "Red Sox Rookie's Tale of Trail to Big Time like Fable Come True." Portland Oregonian, June 4, 1985, p. D1. ↑ "Bosox Tab beavers' Lyons." Portland Oregonian, June 9, 1981, p. D3. ↑ "Bosox Tab Beavers’ Lyons." Portland Oregonian, June 9, 1981, p. D3. ↑ Peter Gammons, “Lyons on Cutting Edge of the Debate.” Boston Globe, March 20, 1985, p. 34. ↑ Shainkin, Bill (October 12, 2013). "Steve Lyons, Eric Collins out as Dodgers broadcasters". LA Times. Retrieved October 13, 2013. ↑ Wilbur, Eric (April 3, 2014). "Steve Lyons joins NESN as Red Sox studio analyst". Boston Globe. Boston, MA. ↑ Fleishman, Scott (April 28, 2015). "Sox talk with Steve Lyons". WCAX-TV. Burlington, VT.
1 2 "Fox fires Lyons for racially insensitive comment". ESPN. Associated Press. Retrieved February 8, 2014.